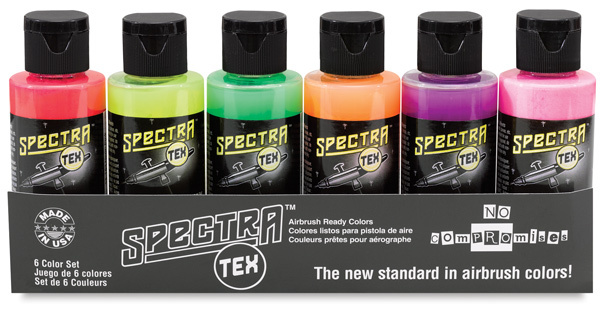 These sets are a great way to experience the fantastic quality of Badger Spectra Tex Airbrush Colors. Specially formulated for professional airbrush artists, these water-based, low-viscosity paints offer outstanding flow characteristics that virtually eliminate tip drying. This set contains 2 oz bottles of Neon Wild Berry, Neon Purple, Neon Orange, Neon Green, Neon Lemon, and Neon Red. 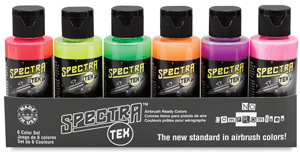 ® Badger is a registered trademark.™ Spectra Tex is a trademark.